A project by the Eagle River Water & Sanitation District and the town of Vail will require work on South Frontage Road in West Vail through Monday, July 2. Motorists are advised to use alternate routes, including the new Sandstone underpass. VAIL — A portion of South Frontage Road West, east of the Interstate 70 Exit 173 roundabout, will operate with alternating one-way traffic through Monday, July 2, due to an infrastructure improvement project by the Eagle River Water & Sanitation District and town of Vail. The district is installing new sewer main that will increase sewer main capacity in the West Vail area so it can accommodate peak sewer flows in the future. The district is partnering with town to install electrical conduits to allow for the removal of existing overhead power lines. The district and town are cooperating to complete both improvements while reducing impacts to the public. Phase 2 of the project began Monday, June 25 on South Frontage Road by Conoco. From 7 a.m. to 7 p.m., the eastbound lane of South Frontage Road near Conoco will be closed and the westbound lane will have single-lane alternating traffic. 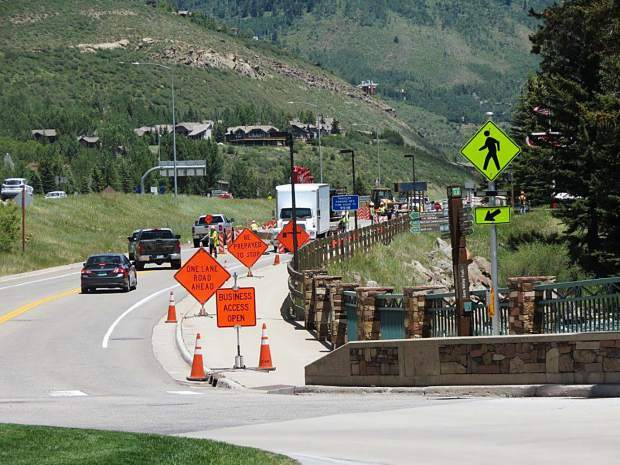 To prevent traffic from backing up into the West Vail roundabout, motorists are advised to use alternate routes including the Main Vail exit on I-70 or North Frontage Road to the Sandstone Underpass to reach the Matterhorn and Cascade neighborhoods and Lionshead village. Both lanes will be open during non-work hours. The bike path is detoured through the construction area and the ECO Transit bus stop has been temporarily relocated a bit east of the regular stop on South Frontage Road West. Conoco will remain open and accessible during construction. The district will suspend work July 3-5 during the Independence Day holiday. The district continues working on Phase 1 of the project in the Intermountain area, also on South Frontage Road between Elliot Road and Stephens Park. Unforeseen subsurface conditions at extreme depths led to a redesign of the downhill portion of the sewer main, which extended the duration of Phase 1. Due to narrow conditions, that work requires one lane of the road in the project area to be closed at all times. Motorists and non-motorists can travel in the remaining lane via alternating one-way traffic 24 hours a day. Flaggers manage traffic operations during work hours — generally 7 a.m. to 7 p.m. — and automated traffic lights manage traffic at night. Bicyclists, skateboarders, and other non-vehicular users on that stretch of road must also comply with flaggers and traffic lights at all times for their safety. The traffic lights are located on the east and west ends of the project area and are set to allow sufficient time for travelers to clear the affected area before allowing travel in the opposite direction. The two-phase project is the second in a district-wide capital plan to address growth and meet water quality regulations for at least the next 20 years. For more information, go to http://www.erwsd.org or call district customer service, 970-476-7480.